So you dragged an old heap home. Depending on what you buy and from whom you buy it, you might have a car that is already pretty clean, or you might get something that’s been off the road for years and used as a storage shed, or worse. What I like to do first is clean the car out. Have a garbage can handy so you can get rid of trash immediately and keep your work area clean, and remove anything from the car that isn’t bolted down. Remove the jack, the spare tire, trunk mat; get everything out of the trunk, the interior, and the engine bay. Clean out the ashtrays, glovebox, and all the map pockets and storage bins. Set aside anything that belongs to the car, and then clean or wash anything you’re keeping. If you’re not putting it back in the car, box it up so it can be stored neatly. Get out the shop-vac and really get the dirt out. Get into the trunk and vacuum all of the nooks and crannies, the wells on the side of the trunk, etc. Then vacuum the headliner, the dash, door panels, seats, and finally the carpets. Go over the seats and carpets with a stiff brush (a pot-scrubbing brush or fingernail brush works well) to really loosen the dirt before vacuuming. Vacuum under the seats, inside all of the ashtrays, the glovebox, and any storage compartments the car has. If there is anything stuck inside (chewing gum, etc) scrape it out as well as you can. The point here is to make the car nicer to work on, and it’s also encouraging to see the immediate results of a good cleaning. If the car smells like cigarette smoke, or worse, remove the seats and carpet and vacuum all the ash off the floor. Remove any HVAC ducts you can get to and wipe them out, or run them through the dishwasher. Wash the seats and carpet with a steam cleaner or extractor. You are going to have to pull all the smoke or whatever is causing the stench out of the upholstery and carpeting. You may as well pull the drain plugs and wash the floorpan with soap and water if you’ve gone this deep. Be careful not to get water on any sensitive electrical components, let the car drain and dry thoroughly, and dry out all the seats and carpet before putting it all back together. You can let it dry while you move on to the next step. First, knock all of the pine needles, leaves, etc, off of the car; they are much easier to remove when dry. Pull any sunroof or T-top panels out and vacuum around those areas. Vacuum all the loose junk out of the cowl vents and from behind the front fenders. You may have to loosen or remove the fender liners to get to everything. Vacuum any leaves or garbage from the engine compartment and all the little grooves around the trunk lid, engine compartment lid, etc. Now, a good wash. Try to do this in the shade or on an overcast day. Since you will be rinsing soap and possibly harsher chemicals off the car, choose an appropriate location. I do it on my lawn so that the grass will help filter out the bad stuff before it runs off into the storm drain. Find a garden hose and soak the car gently but thoroughly with water. This is a good time to look for leaks, especially if you have a sunroof, T-top, or convertible. For T-top MR2s, make sure that your roof drains are clear, and order a set of eccentric rod guides if the glass roof panels don’t fit as tight against the car as they should. Assuming you have no significant water leaks, get yourself a bucket, a hose with a high-pressure nozzle, some car shampoo and a wash mitt. Turn the water up and blast as much of the junk as possible from the exterior. Start at the rain gutters, then the cowl vent area, then the cavity behind the front fenders, all the wheelwells, behind the bumpers, and any other place that could collect mud, leaves, or other debris. If you can see it, blast it. If you can’t see it, blast it too. If you don’t wash it out now it’s just going to make it that much worse when you go to work on that part of the car. Besides, removing all the accumulated crap makes it a lot easier to be sure the sheetmetal isn’t rusted through. If you have a local automated car wash that has an undercar wash feature, it might be a good time to put the car through that as well. Be smart about where you put water. Shooting water at any electrical or electronic component, or into an air cleaner or throttle body, or into any lubricated assembly via any vents or exposed ports, is pretty much guaranteed to ruin something very expensive. Once you get rid of the heavy grime, rinse the whole car again, top to bottom, with plain water. 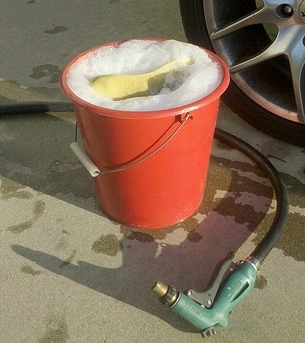 Then put some car shampoo and fresh water in the bucket and wash the car, top to bottom, with the wash mitt. Wash one panel at a time, then rinse, then wash the next panel. Work from the rooftop down to the rocker panels. Be sure to wash all the hidden areas, like the pop-up headlights, behind the gas door, around the trunk and hood openings, and the door jambs. Choose a wheel cleaner appropriate for the type of wheel the car has, and clean the wheels. I like to use a stiff bristled brush, like a parts cleaning brush, or a paintbrush to get around the lug nuts and spokes. Be sure the wheels are cool and out of direct sunlight when you use any wheel cleaner. Scrub the tire sidewalls while you’re there, and rinse thoroughly; any cleaning chemicals left on the wheel will eventually etch or dull the finish. Finish by drying the car with a chamois to prevent water spots and make it easier to work around the car. Like the wheels, the engine must be cool before you clean it. Some of the products you will be using are very aggressive, so protect any surrounding areas from overspray. You don’t want your fenders marinating in Foaming Engine Brite. If the car is carbureted, you might want to clean the carburetor first. Remove the air cleaner and spray the outside of the carb with carburetor cleaner. Reinstall the air cleaner and clean the rest of the engine. I usually go with Gunk or any other brand name engine cleaner. Be careful not to soak the distributor, carburetor, or any other sensitive components, but get everything else good and coated with a nice thick layer of engine cleaner. Engine cleaner is powerful, so wear gloves and eye protection. Use common sense. As the can says, use a brush to remove heavy deposits. Be careful around any decals or paint that you want to keep because it may fade or otherwise destroy them. Once that has been allowed to work for several minutes, rinse it off throroughly, again keeping the water away from the carburetor and distributor, and then clean the rest of the engine bay. I usually use about a 4:1 mixture of Castrol Super Clean and water, and a stiff, parts-cleaning type brush. You can spray straight Super Clean onto the really filthy surfaces first, but it is very caustic, and will dull most painted and anodized finishes. This is mean stuff, so take appropriate precautions. With your brush, scrub every surface you can reach, starting at the top and working down. I’ll usually start at the dirtiest corner and work my way around the bay in a circle, rinsing as you I go to prevent dulling of paint and plated surfaces. Once you’ve cleaned everything, rinse it all again and look for anything you may have missed, spot-cleaning as necessary. Hopefully you now have a car that looks decent enough that your wife (or parents, or landlord, etc.) doesn’t resent its presence. It’s also a lot more pleasant to work on a clean car. Next chapter: some mechanical issues to address before the car can be safely driven.